The FAMILIAR ensemble. Photo by Dan Norman. Cultural identity is rarely simple for immigrant populations. In leaving home for new frontiers, immigrants are daily tasked with balancing the dual ideals of assimilation and heritage. To nurture both is a lofty undertaking that demands determined effort and can easily become a burden. The plot centers on the impending wedding of Tendi (local gem Shá Cage), the eldest daughter of a successful Zimbabwean family living in Minnesota. She is engaged to Chris, an affable and affectionate “white guy from Minnetonka” (Quinn Franzen), and Tendi’s outspoken mother Marvelous (Perri Gaffney) is determined to deliver a westernized affair free from African tradition. While there is some simmering conflict between Marvelous and her obliging husband Donald (Harvy Blanks), all seems to be going as planned. This despite the pleas of her youngest daughter Nyasha (Aishé Keita) to pay greater respect to their African history and the presence of Margaret (Austene Van), her strong-willed, peacemaking sister who never lacks a glass of wine. But when her proudly African sister Anne (Wandachristine) makes a surprise appearance from across the ocean, and Chris’s brash brother Brad (Michael Wieser) drops in, family priorities clash and longstanding tensions erupt. Director Taibi Magar highlights Familiar’s strengths through subtle lighting touches (by Tom Mays) and lively blocking that allows her uniformly excellent cast to carry the show and maintain its frenetic momentum. 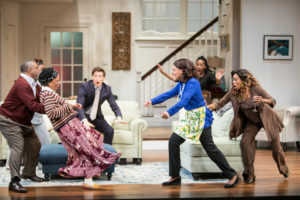 The set design (by Adam Rigg) is spacious and filled with realistic detail that aptly captures the comforts of affluence and heightens the show’s themes. Karen Perry’s fantastic costumes are perfectly suited to the characters, helping illustrate characters with color and shape. All of the actors deliver memorable portraits, providing fully-fleshed, sympathetic, uniquely quirky personalities whose interactions feel organic and believable. This is especially impressive in a show with so many principle characters whose comedy hinges on cultural differences and broad hijinks. There are moments in Familiar that are uproariously fun—the Guthrie has delivered a true crowd-pleaser. Delivering both belly laughs and thoughtful cultural commentary, Familiar is unexpected and delightful. If you are seeking a good time without having to turn off your brain or your heart, you will not be disappointed.